So our wanderings lead us to Spot dessert bar on St.Marks place. We've eaten there before, years ago when they first opened, but we haven't gone back since (about 7 years?) So this time around we went with some friends and basically ordered everything on their menu, after all it's a restaurant that only serves sweets. The restaurant is tiny tiny tiny. If you've ever visited NYC you know that the trendiest restaurants are usually also the smallest closets. So in this tiny closet, they seated all four of us full grown adults at a table really meant for 2. We squeezed in the best we could and still decided to order 4 dessert plates, tea and two huge stuffed cookies. We filed every square inch of this table with sugar. There was a cake that came out looking like a big orange, but was filled with Milk Chocolate orange mouse and a chocolate brownie. A matcha lava cake and a milky puff which is a warm cream puff filled with milk ice cream, bruled bananas and cornflakes. But the best best best thing we ordered by far was the Golden Toast. Now brace yourself, This is a huge thick fluffy slab of milk bread slathered in butter and honey, toasted , then served with condensed milk ice cream and strawberries. Oh... My....GAWD. This was sooo good. The bread was fluffy, and stringy in the best possible way. It was warm, crisp and sweet on top from the honey butter which complemented the cold creamy condensed milk ice cream perfectly. We could have had this everyday if it was possible. But alas, we had to head home to Texas and in order for me to get this fix, I came up with this Honey Butter Milk Bread Ice cream Sandwich. This starts with a slight variation of the Hokkaido Milk Bread recipe I posted last year. Instead of rolling it into loaf pans, I shaped these into buns, and I replaced half of the sugar with honey. These get baked up and kept warm. Then for the Condensed milk ice-cream. Making this was easier than I thought! Since I don't have an ice cream maker, I was thrilled to see that condensed milk ice cream was more like a semifreddo with only 3 ingredients: heavy cream, vanilla and condensed milk. The heavy cream gets whipped into soft peaks with vanilla bean paste. Then the condensed milk gets poured in and it all whips together into a lusciously cream and sweet concoction. I poured this into an ice cream container I bought off amazon and into the freezer for 4 hours or I did it overnight just to be sure. The full recipe can be found here. Then comes the plating. To serve, I split my buns in half, then slathered softened salted butter over both sides, and a drizzle of honey. I placed these under the broiler for 3-5 minutes till they got golden. A generous scoop of ice cream gets sandwiched in between and you got yourself the best darn ice cream sandwich you've ever had! To make the starter by whisking the flour, milk and water together until smooth. Bring to a simmer over medium-low heat and cook, stirring often, until thickened but still pourable, about 6 minutes. When it’s ready, the spoon will leave tracks on the bottom of the pot. Scoop out to a small bowl, cover with plastic wrap and set aside to cool to room temperature. To make the dough: combine the flour, sugar, yeast and salt and mix for a few seconds in an electric mixer fitted with a dough hook. Add egg, milk and the starter. Turn the mixer on low speed and knead 5 minutes. If dough seems too wet (which can happen on humid days) add additional bread flour in 1 tbsp intervals. Add the butter one piece at a time and knead for another 10 to 12 minutes until the dough is smooth and springy and just a bit tacky. The dough should pull away from the sides but it ok if it has a bit of a wet foot at the bottom of the bowl. Lift the dough out of mixer, shape into a ball and place into a buttered bowl. Cover with a kitchen towel and let rise in a warm place until doubled in size, about 60 minutes. 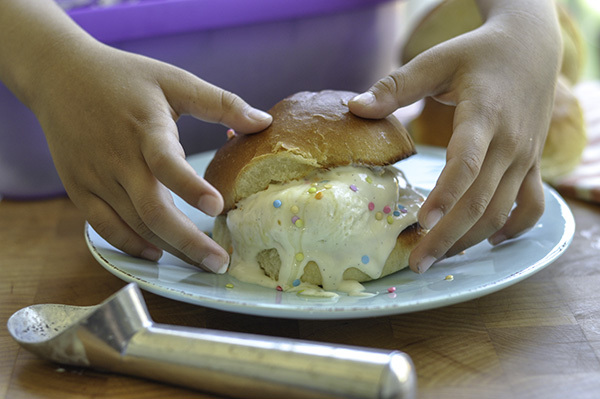 Punch the dough down and use your hands to scoop it out onto a surface. You won't need much bench flour at all, the dough is quite easy to handle. 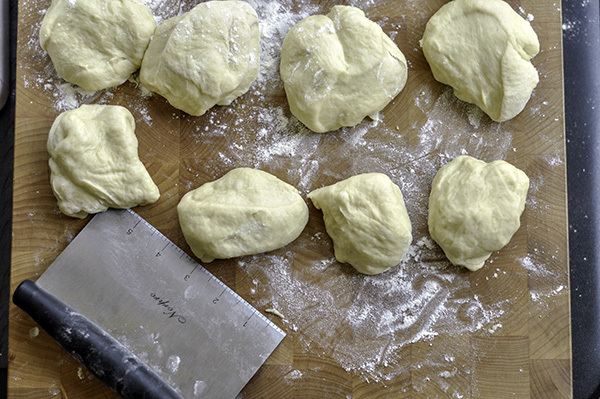 Using a bench scraper, cut dough into 16 equal portions. Form the dough into balls, cover again and let rise 15 minutes. Line two large cookie sheets or jelly roll pans with parchment paper. Shape the balls of dough into rolls by stretching the surface of the dough into itself and tucking it underneath or pushing the dough between your thumb and middle finger to create a smooth, even ball. Place on the pan and repeat with the rest of the dough spacing them about 2 inches apart. Cover and allow to rise for 45 minutes. Pre heat the oven to 350F. Brush the tops with milk and bake on the bottom shelf of the oven until golden brown and puffed, 20-25 minutes. To make the sandwich split a bun in half, spread on butter and honey and broil for 2-5 minutes. Watch it closely so that it doesn't get overly brown! 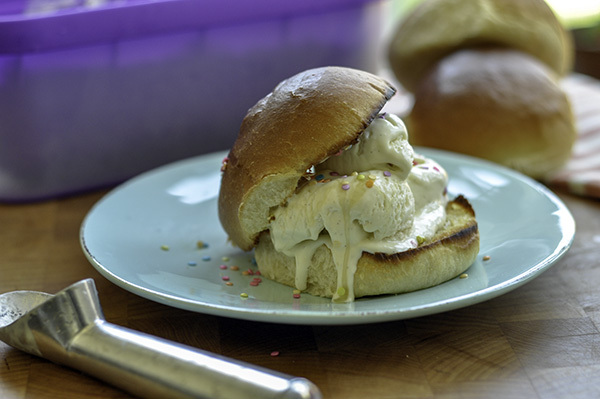 Place 2 to 3 scoops of condensed milk ice cream a drizzle of honey and sandwich together for a seriously amazing treat!